Although I liked my first two Scottish 80 Shilling Ales, judges in the competitions I entered them into decidedly did not. The second actually scored worse on average than the first, despite the fact that it incorporated feedback from the judges of the first recipe. This time around, I decided to build my own recipe after having a look at the BJCP criteria for the style and the ingredients it recommends. 1/4 tsp. Yeast Nutrient at 15 min. 1/4 tsp. Brewtan B in at 15 min. 1/2 tsp. Irish Moss at 10 min. The plan is to leverage my new BrewJacket fermentation temperature control setup for this batch, keeping the wort temperature at 68F (in the middle of the Edinburgh yeast's 65-70F optimum range) for the first 7-10 days of fermentation. If the final gravity has not been reached by that time, increase to 70F and hold there until final gravity is reached - or until the gravity has held constant for at least 3 days. After that, I'll bottle with carbonation drops and condition for 7-10 days at ambient basement temperature (68F this time of year) until carbonated. 07/29/2018: Despite my best efforts to get the recent Zymatic errors sorted out, the system has continued to have trouble. Generally speaking, any time the Zymatic has to heat wort by more than a few degrees, it seems to generate the dreaded "Fatal Error #1" which implies that the temperature of the heat loop is 50F higher than the temperature of the wort itself. This is generally thought to imply that there is a clog somewhere in the lines that prevents the wort from flowing smoothly past the heat loop, thus causing the heat loop to be much hotter than the wort. Rather than burn up the components inside the Zymatic, the computer throws the Fatal Error code and stops the brew immediately. Unfortunately, I could not find a problem. The keg posts were clear of debris and clean. The in-line filter was also clean. Water seemed to be flowing through the system well when I set it to recirculate. After a few attempts, I got it to Dough In. Then it generated the Fatal Error again. After a few more attempts, I got it through the mash and boil process. According to the information kept by the PicoBrew site itself, it took seven tries to get the beer brewed this time around. Original gravity came in two points below the expected gravity, which is pretty close... close enough that I didn't try to adjust it. Volume came in low, as it usually does, somewhere around 2.25 gallons rather than 2.5 gallons. After chilling with the immersion chiller for about 8 minutes, the wort was down to 77F. At that point, I transferred it to the sanitized fermenter with the Clarity Ferm and put the BrewJacket to work chilling it down to 68F before I pitched the yeast. (I'll cover the BrewJacket in more detail in a future post, but don't want to talk much about it until I feel like I have a good enough impression of its pros and cons.) By about 11pm, the wort temperature hit 68F and I pitched the yeast. 07/30/2018: Nearly 24 hours later and no change in gravity or temperature. Removing the airlock and peering inside, it was clear that the yeast did not start fermenting. I opened a package of Danstar Windsor Ale Yeast and added it to the wort. At that time, gravity registered 1.058 SG at 68F. 07/31/2018: Fermentation kicked off pretty strongly around midnight after the yeast was pitched. By 8pm, gravity was down to around 1.032 SG. 08/01/2018: Gravity is down to around 1.020 SG now. That works out to apparent attenuation of 64.9% and 4.86% ABV. The yeast can reportedly attenuate 73-77%. I raised the fermentation temperature to 68.5F to help get the yeast through the last of the sugar. I am debating raising it to 72F and rousing the yeast by swirling the fermenter a bit, to see if I can get it down to my intended 1.017 SG final gravity. 08/02/2018: Today the gravity has dropped to 1.017 SG. That's 70.18% apparent attenuation and 5.25% ABV. Temperature has held at 72F since I set it there last night. 08/03/2018: The gravity is now 1.017 SG. That's 71.93% apparent attenuation and 5.38% ABV. I reduced the temperature to 71F, and plan to reduce it to ambient temperature. 08/04/2018: Gravity has been at the 1.017 SG target since around 10pm on August 2. Tomorrow I'll give it a dose of gelatin and cold crash it before bottling. 08/12/2018: Gravity has been holding at 1.016 SG for some time. I lowered the temperature to 50F and held it there for several days. Today, I bloomed a teaspoon of gelatin and heated it to 155-160F before adding it to the fermenter. I placed the fermenter inside the mini-fridge to allow the gelatin to get the beer nice and clear. I'm expecting to bottle it next week. Aroma (7/12): Malt-forward, with strong caramel notes, and a touch of butterscotch. Could use a touch of pome fruit and a hint of English hop aroma, which would bring it closer to a 12/12. Flavor (15/20): Malty, with a hint of roastiness, some toffee, and a touch of dark fruit. A very subtle butterscotch note comes through as well. Balanced bitterness, allowing the malt to shine through. Some fruity esters would push it toward 20/20. Appearance (3/3): Bright, coppery, with a thin off-white head. The head is nice and creamy but does not last that long, and leaves behind no lacing. Looks as good as any true Scottish-made ale I've seen. Mouthfeel (5/5): Medium-bodied, creamy, and smooth. Exactly what I want from the style. Overall (8/10): I'm very pleased with this one. The appearance is exactly what I wanted from it, a nice coppery brown. I'd like to see the head linger a bit more, but it's good as-is. The flavor is complex, starting a bit caramelly, followed by a touch of sweetness and a roasty note, with a hint of dark fruit and butterscotch near the finish. Finish is roasty and complex. Replace some of the Maris Otter with Carapils. In my experience, the combination of Carapils and Melanoidin makes for a creamy, long-lasting head. That would make the beer's appearance (to my taste anyway) dead-on perfect. Maybe 4 pounds of Maris Otter and a half-pound of Carapils malt in place of 4.5 pounds of Maris Otter. Evaluate other yeasts and hops. To really nail the BJCP criteria for this style, it needs a bit of pome fruit (apple, pear, and/or quince) in both the aroma and flavor. Some of this could come from the choice of hop and/or the choice of yeast, as some yeasts give off an apple aroma. I'm thinking Mangrove Jack Burton Ale or White Labs WLP023 Burton Ale might add a pear note. Late-hopping for some English hop aroma. The BJCP criteria talk about pome fruit, earthy, citrus, floral, or spicy aromas in the best examples. I'm considering Challenger, First Gold, Progress, or another UK variety. I'm hoping some combination of these changes will take the beer over the 40/50 scoring line. My first attempt to clone Coniston's Old Man Ale was sort of a flop. Instead of producing a reddish brown English style brown ale, it produced a deep black ale reminiscent of an export stout. I don't know if this is because the homebrew shop didn't measure the specialty malts correctly, or because I ordered the amounts incorrectly, or what, but it bore no resemblance to the beer I was trying to brew. On the other hand, it was actually quite a tasty beer and I view it as a happy-but-unrepeatable mistake. I ordered a new set of ingredients this time, and the resulting beer was indeed a reddish-brown color as it came out of the Zymatic. This leads me to believe the original set of ingredients from the homebrew shop contained a bit too much roasted barley. The Zymatic's high-efficiency mash profile was used, unmodified. A 60-minute boil was used. After the boil, the wort was chilled using an immersion chiller before pouring into the fermenter. 07/23/2018: The Zymatic has been very frustrating of late. This batch generated four "Fatal Error 1" messages before the water even made it into the grain compartment of the step filter. Each time, I recirculated the water through the system until it cooled down the heat loop and restarted the brew. Eventually the water reached Dough In temperature (102F) and the brew began. About 20 minutes into the mash, I looked at the step filter and realized the grain compartment wasn't flooded. This meant that full conversion was very unlikely. I could see that wort was not flowing smoothly through the sample port into the keg, which implied a blockage somewhere in the system. I paused the brew, disassembled the keg posts, and found (as I've seen many times) the string in the ball lock post clogged full of debris. Removing the debris and reassembling the post seemed to do the trick. When I resumed the mash, the liquid flooded the grain compartment as expected. From there, the brew finished without another error. The most likely cause of the issues I saw before the mash is a blockage somewhere inside the Zymatic. After the brew, I ran their new Beta-test cleaning program on the machine. When the cleaning program finished and the machine was flushed with clean water, I began a "super deep clean" process. In this process, a Finish dishwasher tablet is dissolved in a gallon of hot water and poured into the keg. A "recirculate" cycle is started and allowed to run for a while to ensure that the lines inside the machine are all filled with hot cleaning solution. Then the recirculation is interrupted and the machine turned off. The cleaning solution is left in the machine overnight to soak and (hopefully) remove whatever is clogging up the works. Tomorrow night I'll run several rinse cycles through the machine to wash out the cleaning solution and hopefully the next brew will go more smoothly. If not, it will be time to reach out to the PicoBrew folks for help again. The beer turned out two SG points lower than expected, possibly due to the issues with the first mash step, where not all of the grain was submerged. This was close enough that I didn't supplement with malt extract or anything else. Wort left the chilling process at 75F. The Burton Ale yeast's optimal fermentation range is between 68F and 73F, so I strapped ice packs to the outside of the fermenter to chill it a bit. Within a few hours, the wort temperature had dropped to 71F. By morning, it had dropped to 67F, the ambient basement temperature. 07/23/2018: Although the yeast packet pitched into the wort had an "use by" date at least six weeks into the future, by 7:30pm (19 hours after pitching) there was still no sign of fermentation. The Tilt Hydrometer still registered a gravity of 1.047 SG and 67F for the temperature. I took out a Wyeast 1275 Thames Valley Ale yeast pack and smacked the nutrient pack. At 10:30pm, I added it to the wort. 07/25/2018: The Thames Valley yeast kicked off and did the job. About 9 hours after I added it, the gravity began dropping. About 22 hours in, the temperature had increased to 70F and the gravity had dropped to 1.036 SG. I used a bungee cord to attach an ice pack to the fermenter. About 2 hours after that, the temperature had dropped to 62F. About 24 hours after that, the gravity dropped down to 1.016 SG, while the temperature had gone back up to 71F. A new ice pack was applied and as of this moment the beer is down to 1.013 SG and 67F. This works out to 73.77% apparent attenuation and 4.55% ABV. That's a bit more attenuation than I expected from the original yeast, but Thames Valley might go as high as 76% before it's finished. 07/26/2018: The gravity has dropped to 1.009 SG today, with a few blips at 1.008. The temperature has dropped to 66F. I would guess that the bulk of fermentation is over at this point, with 82.98% apparent attenuation and an ABV of 5.12% - far more attenuation than I had expected. 07/27/2018: The gravity has leveled off at 1.008 SG at 69F. That's 85.11% attenuation and 5.25% ABV, a bit higher than the real Old Man Ale's 4.4% ABV. 07/29/2018: I bottled the beer today using three small carbonation tablets per bottle (low carbonation). It has a good brown ale flavor to it, but seems to lack the tartness I detect in the real Old Man Ale. We'll see how it turns out when it's carbonated. I set the "hot box" to 71F. 08/03/2018: I opened a bottle today for the photo and initial tasting. It poured considerably darker than I expected or intended. It's almost totally opaque, rather than the reddish brown I was looking for. That said, the aroma is a nice mix of caramel and chocolate. The flavor starts lightly sweet and caramelly, then the roasted barley note swells up. This roasty note isn't right for the style, according to BJCP guidelines, so I'll need to do something about that in the next version (and lighten the color). While it's not the beer I want it to be, it's actually a very tasty beer - more reminiscent of an export stout than a brown ale. Head retention is quite good, and the head is almost milkshake-like. 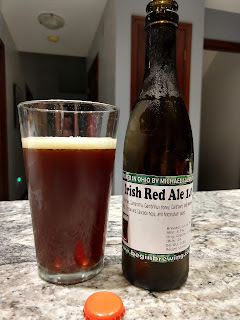 I ran across a recipe online for Raging Red Irish Red Ale and it seemed that people who had made it really enjoyed it. I've wanted to brew an Irish Red Ale for a while, so I ordered the ingredients. After they arrived, I realized I had mis-read the honey in the ingredient list as Gambrinus Honey Malt, so my version will be a little different from the original. I'm also swapping the California Ale yeast for Danstar Nottingham Ale yeast, which has a similar attenuation and might be slightly more authentic. I also decided to use some Brewtan B in this recipe since I had it on-hand and wanted to see how it might help this beer's flavor hold up over time. It's worth noting that the BJCP guidelines for the Irish Red Ale range from 1.036 to 1.046. The High-Efficiency Mash Profile was used, unmodified. The Zymatic step filter's hop basket 1 was loaded with the Crystal hops, basket 2 with the Cascade hops, basket 3 with Brewtan B, and basket 4 with Super Irish Moss. 07/08/2018: The grain was crushed and added to the Zymatic step filter. Hops and other ingredients were also loaded. Brewtan B was sprinkled over the grain bed. The water was measured and added to the keg, and the Zymatic told to begin brewing. The brew went pretty much perfectly through the first stage of the mash. Part-way through the second step of the mash, the wort temperature began to fluctuate up and down. This continued throughout the boil. When the brew was finished, and I attempted to pump the wort into a kettle for chilling, it barely came out. I resigned myself to risking a burn by dumping out the contents of the keg. When I removed the black ball lock connector, it made a vacuum style hiss. That sound made me realize that most likely the problem was a blockage in the keg post or tube. I removed the post and found the spring inside to be full of gunk. I cleaned it and made sure that water would flow through the dip tube. After reattaching the dip tube and ball lock post, the Zymatic was able to pump out the wort without a problem. Unfortunately, the flow problems seemed to negatively affect the gravity, with the beer turning out 1.050 SG instead of 1.062 SG. 07/09/2018: Today the gravity is down to 1.035 SG and the temperature has risen from its low of 64F overnight to 69F today. That's 30.1% attenuation and just a hair under 2% ABV. 07/10/2018: I strapped two large ice packs to the fermenter last night, which got the temperature down to 59F around midnight. Today, the temperature is back up to 68F and the gravity has dropped to 1.011 SG. This represents 80% attenuation and an ABV of 5,25%. This is four points lower than I expected to get, and fermentation may not be finished yet. We'll see. 07/11/2018: The gravity has dropped to 1.008 SG now (in fact, since about 7am today), well below the 1.015 SG I expected. This gravity represents 84.24% attenuation and 5.53% ABV. I'll probably cold crash it tomorrow and bottle it over the weekend. 07/12/2018: The gravity is still holding at 1.008 SG. 07/15/2018: I treated the beer with a half-teaspoon of gelatin and placed the fermenter into the mini-fridge to clarify. 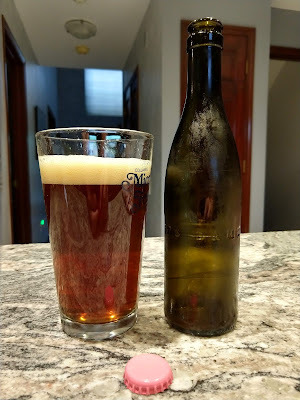 07/22/2018: The beer was bottled with 1 large or 3 small carbonation drops per bottle. Yield was 23 bottles. 07/27/2018: A bottle was placed in the freezer to chill quickly for a taste test. 07/30/2018: Another bottle was chilled in order to taste and photograph. The beer pours a deep red with thin beige head that lingers briefly before reincorporating into the glass. Aroma is malty, with caramel and a little butter (which is in line with BJCP criteria). If hop aroma is getting through, it manifests as a floral hint. Flavor is malty wit hints of caramel, balanced against a light roasty note. Hop bitterness balances nicely against the malt. Mouthfeel is medium. Finish is malty, dry, and mildly bitter. Smooth and easy to drink. My first attempt at cloning Georgetown Brewing's Manny's Pale Ale was a dismal failure. It was a drinkable beer, but not pale in color and nothing like a pale ale in flavor. The second version was more like a pale ale in flavor, but still a touch dark in its color. 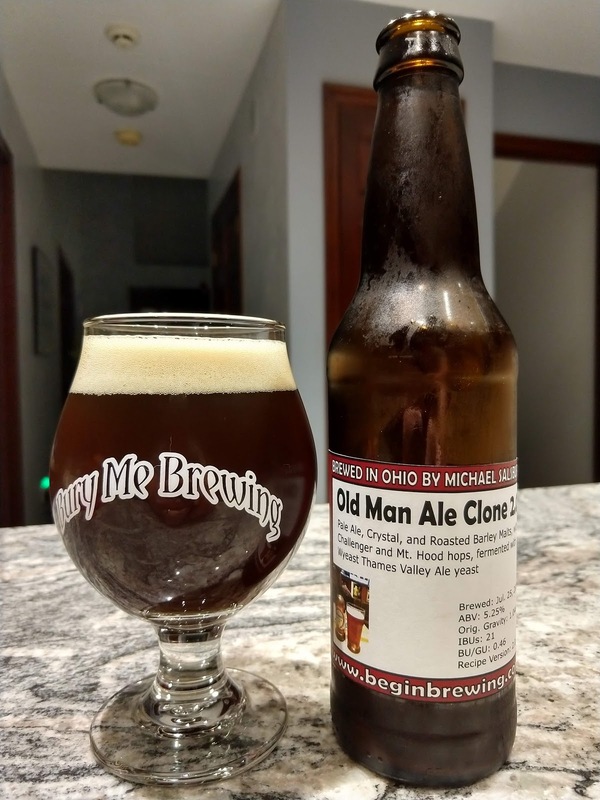 The family member who loves the real beer says this version is too "malty" (which I'm interpreting as the beer having too much Caramel malt or too dark of a Caramel malt). In this version, I'm switching from Caramel 60L to Caramel 40L and decreasing the proportion of the Caramel malt in the recipe. I didn't have as much Pale Ale malt as I thought, so I substituted 2-row Brewer's Malt to fill in the missing amount. I've no idea how this will impact the finished flavor. My packet of yeast was almost six months old at the time I pitched it, so I'm concerned that it may not have enough viable cells to ferment the beer. If not, I'll pitch some Safale US-05 to do the job. Hopefully it will be close enough if I need to use it. 07/04/2018: The brew went fairly smoothly, although I did notice the temperature differential between the wort and the heat loop getting above 30F apart. That's fairly close to the 50F limit where the machine will shut down. I suspect that there may still be a blockage in the system that hasn't fully cleared yet. The volume produced and the gravity were lower than expected, either because of the initial issues with the mash temperature or the swapping of 2-row Brewer's Malt for 2-row Pale Ale Malt. Regardless, the resulting beer was close enough to the expected gravity. At the time the Tilt began logging (12:44am on July 5) it registered a temperature of 77F and gravity of 1.055 SG. 07/05/2018: There is no sign of yeast activity, so I pitched a packet of WLP001 California Ale Yeast into the fermenter to see if it would jump-start fermentation. 07/06/2018: The WLP001 also showed no activity after 12 hours, so I pitched a packet of Safale US-05 which I knew would take off. The gravity registered as high as 1.060 SG overnight but is down to 1.050 this morning. 07/07/2018: Gravity is down to 1.024 and the temperature is up to 74F. That's 55.9% attenuation and 4.3% ABV. 07/08/2018: Gravity has dropped to 1.010 SG and temperature down to 69F. 07/09/2018: Gravity has stabilized at 1.010 SG and the temperature has dropped to 68F. 07/10/2018: Gravity is still 1.010 SG and temperature remains at 68F. That's three days at the same gravity, so the beer can be bottled any time now. Since the original Manny's Pale Ale isn't clear, I'm thinking I may bottle this tonight or tomorrow night. 07/11/2018: Gravity has continued to hold at 1.010 SG. 07/12/2018: Gravity is reading as 1.009 SG today and 68F for the temperature. 07/15/2018: The beer was bottled today with three small carbonation tablets per bottle. Yield was 24 bottles. The last Cream Ale I made was an experiment to see if a drinkable cream ale could be produced with a three-hour Zymatic brewing session. The result was a drinkable but slightly hazy, slightly tart beer. While not the equal of the original 1.0 version of the recipe, it was actually a great warm weather beer. This time around, I am going back to the original recipe, with only a slight change to the grain bill to get a little better head retention. I'm adding some cara-pils malt for that. The beer came out slightly under the gravity and volume targets, but close enough. 07/02/2018: The Zymatic has seemed to be struggling lately. I've gotten the "Error Code #1" on my last two brews. According to the available information, this implies that the temperature of the heating elements exceeded that of the wort by 50F. Usually this implies some sort of blockage in the wort lines or an air leak somewhere in the system. The recommendations when you see this error are to look for air leaks and to run a cleaning cycle to see if that clears the blockage. After this batch brewed, I ran three rinse cycles with hot water. I'm planning to run a deep clean cycle before the next brew to see if any other "gunk" can be cleaned out. The Tilt Hydrometer was sanitized and dropped into the wort just before the yeast was pitched. The refractometer read 13.1 Brix or 1.051 SG. The Tilt registered 1.050 SG initially but settled in to 1.049 SG and a temperature of 75F after the yeast and Clarity Ferm were pitched into it. The beer is expected to get down to a final gravity of 1.007 SG after fermentation. As I look back over the original Kari's Cream Ale recipe that this is based on, I see that the original recipe used Pilsner malt and 2-row Pale rather than 2-row and 6-row. I'll have to try it that way next time if this doesn't turn out well. 07/03/2018: The Tilt Hydrometer now reads 1.043 SG and 69F, down from 1.051 SG yesterday and 75F. That works out to about 15.7% attenuation and 1.05% ABV so far. 07/05/2018: The Tilt now reports temperature of 71F and a gravity of 1.011 SG. That's about 78.4% attenuation and 5.25% ABV. 07/06/2018: Gravity has dropped to 1.006 SG, representing 88.2% attenuation and 5.9% ABV. 07/07/2018: Gravity is down to 1.004 SG and temp is at 69F. 07/08/2018: Gravity is still holding at 1.004 SG and the temp is down to 68F. 07/09/2018: Gravity and temperature continue to remain constant. It's time to treat with gelatin and cold-crash. I bloomed a half-teaspoon, heated it, poured it in the fermenter, and moved it into the mini-fridge to chill. 07/15/2018: The beer was bottled today with three small carbonation tablets per bottle (low carbonation). Yield was 22 bottles.